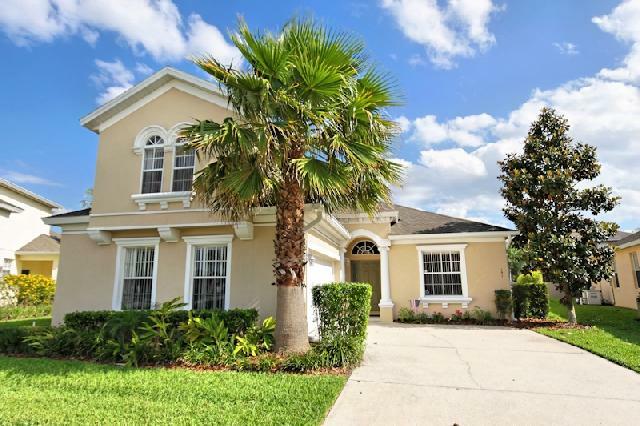 Luxury 4 bedroom, 4 bathroom villa with south facing extended pool and spa, located on gated lakeside community, within 15 minutes of Disney and ideally situated for all of Orlando's attractions, Golf courses, restaurants and shopping. Our luxurious executive villa at Calabay Parc Tower Lake is beautifully furnished, air conditioned and fully equipped for 8 -10 persons and features include a large private south facing pool with Spa and Games Room. Wireless Internet is installed and free telephone calls within USA and Canada. Lounge/family room overlooking the south facing pool area and comfortably furnished with sofas, one of which is a Queen sized sofa bed sleeping two persons, cable TVDVD player. Patio doors give access to the covered lanai and pool area. Dining room is open plan to the lounge and has formal dining table and seating for up to 6 people. Kitchen is fully equipped with dishwasher, microwave, fridge/freezer with icemaker and laundry area with washer/dryer. Informal dining is provided by the breakfast bar with bar stools and the breakfast nook, overlooking the pool area, which has table and 4 chairs. Master bedroom has king-size bed, cable TV/DVD, walk in wardrobe and bathroom with bath, double vanity basins and walk in shower. Door giving direct access to pool area. Second master bedroom has queen-size bed, cable TV/DVD and walk-in wardrobe, bathroom with large walk in shower. Bedroom 3 has twin beds, cable TV, PS2 and en-suite bathroom with bath and shower. Bedroom 4 is upstairs, has twin beds, cable TV/DVD and bathroom with walk in shower. Outdoor dining is provided under the covered Lanai with lighting, ceiling fans, BBQ, table and chairs as well as sun loungers around the pool area. The south facing L shaped pool measures 20ft x 24ft x 10ft max and is provided with a child safety fence. Landscaped gardening provides trees, shrubs and planting to afford privacy to the pool and spa areas. 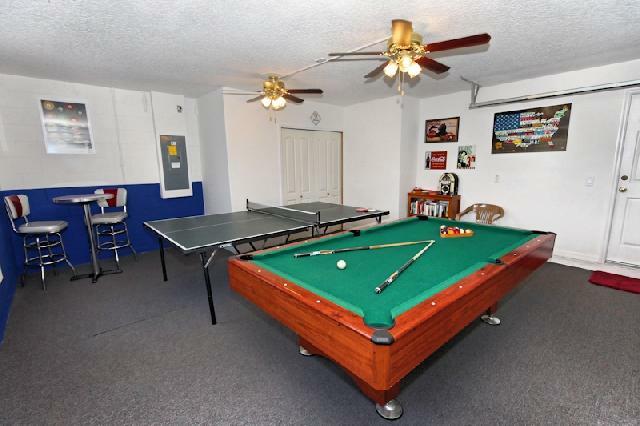 Our Games room is furnished with pub table and barstools, pool table, table tennis, electronic darts board, games and books. Hairdryers, beach towels, travel cot, high chair and stroller are all provided for the convenience of our guests. und tolles Haus! Einfach spitze! owners. Hope to return to soon . We will contact you for our next vacation. We most certainly will use your service for our next FL trip. This was our second year in a row with you and again, everything went extremely well. Our girls loved the pool and the game room. The only issue we had was no BBQ grill as advertised. This was a minor issue, but we never did get a return call on it, after leaving a message with the property manager. No strikes against her though, as I talked to the new owners next door that are very pleased with her. Hopefully we'll have the chance to return in the near future. I have already been referring my work colleagues to your website. Respuesta de FBV Thanks for the nice words,the property has no free BBQ anymore, but one can be rented.